Established in 2006, Tilletts are an independent family owned business providing quality clothes at affordable prices for the every woman. A mother and daughter buying team comprised of Melanie, Grace and Nancy, Tilletts whole ethos is ‘Real Clothes for Real Women’. Tilletts Clothing focuses on the concept of ‘Fast Fashion’ in a ‘One Size Clothing’ collection. The Tilletts target market are ladies ranging from 30 to 65 but have been known to have receive orders from ages 19 to 90! From their humble beginnings at the Flagship store in Seaview Street, Cleethorpes, the Tilletts enterprise expanded by opening a second smaller outlet based in the Georgian market town of Louth. 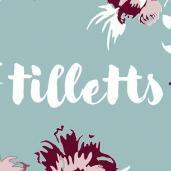 Going from strength to strength, Tilletts decided to branch out online, opening Tillettsclothing.co.uk or as they like to call it ‘Bricks and Clicks’ where they have seen continual growth with customers ordering from all over the world including Australia and the USA. Tilletts pride themselves on providing excellent Customer Service and ensuring every lady leaves the store feeling beautiful and content. The ‘Tilletts Experience’ is imbedded into every aspect of the business resulting in a loyal and devoted customer base.